For over 60 years, W. J. Graves Construction has been supplying quality sand, gravel, stone, loam and other products to homeowners and contractors in the Massachusetts construction industry from its seven pits and quarries. Recently the company acquired a tracked and mobile screening and crushing train supplied and supported by New England based McCloskey International dealer Rock and Recycling Equipment LLC. The McCloskey equipment is now hard at work producing 300 to 500 tons per hour of finished product. W. J. Graves was founded by Wilfred Graves in 1929 when he lost his hourly job due to the Depression. Initially Wilfred delivered milk and cut cordwood, but in 1932 he bought a truck to deliver the wood — which was followed by buying a piece of land for the cordwood in 1933. He later discovered the land contained sand and gravel, so naturally he started to sell that as well. Following the end of the Second World War in 1945, Wilfred began a subdivision of his operation, moving into real estate and selling homes to young families. For approximately 10 years he used the growing sand and gravel business to supply much of the building materials. This growth and continued development led to the incorporation of his sand and gravel business in 1956. Wilfred remained active in the business until 1984 — at which time he sold the business to his grandsons, Jim and John Fletcher, who had both been working with him for several years learning the business. W.J. Graves has continued to expand and develop with Jim and John at the helm of this increasingly important cog in the New England construction machine. W. J. Graves Construction has been a vital source of high quality sand, gravel, stone, loam and other products to homeowners and contractors in Massachusetts for over 60 years and has developed the expertise and know-how to give its customers what they need. Jim and John Fletcher — with Jim having direct responsibility for W.J. Graves and John the concrete division — now run the group jointly. It now employs 85, but is still run to the high standards set by Wilfred Graves himself. “We strive to maintain honesty and integrity in all aspects of our business. With having over 120 vehicles in our fleet and various other equipment we repair and maintain in our own garage facility in order to keep our expenses low and the availability high. Our priority here at W.J. Graves Construction is to give excellent service and products at competitive prices,” said Jim. The list of products supplied by W.J. Graves is impressive and includes bank run materials, clay, crushed base, sands of various sizes and specifications, decorative stones, loam, compost and sand. Additionally, a wide variety of washed and sized materials are supplied by the company — including crushed gravel, natural round stone, washed and natural granite and red stone, as well as a wide range of recycled aggregates to cater for a variety of needs. W.J. Graves processes its materials from a total of seven quarries and gravel pits located in Central Massachusetts. Each site has specific material that allows the company to supply a full range of material to customers, with over 35 trucks delivering material throughout New England, although many customers choose to truck their own material. Supplying the right product is just part of the job for W.J. Graves, as the company places emphasis on supplying not just the right product but a finished product of the highest quality. Thus a major part of the quality process includes washing materials to take away impurities and processing materials to refine the shape and size. 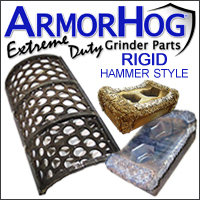 “We provide quality materials, because we believe that gives our customers a product of value,” said Jim. As part of W.J. Graves’ commitment and focus on supplying the very best materials to its customers, often to very tight deadlines, Jim Fletcher and his team recently sought an advanced screening and crushing solution. In order to be highly flexible, productive and efficient, the company realized that a tracked and mobile crushing and screening train would be required for use at multiple sites and locations. Given the many options of equipment on the market, Jim was presented with a large variety of choice. However, a local dealer has also developed a first class reputation for supplying what customers really need and supporting customer operations in the field. The local dealer Jim Fletcher turned to is Rock & Recycling Equipment LLC, which is the full service McCloskey International dealer throughout Connecticut, Rhode Island, Massachusetts, New Hampshire and Maine. Its sells and supports the full line of McCloskey crushing and screening equipment and like W.J. Graves is dedicated to exceeding its customers’ requirements. 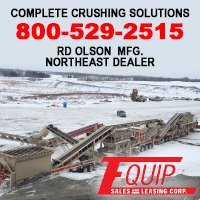 To this end, the dealer supplies the extensive McCloskey line of trommel screens, stackers and crushers, working constantly to support its customers’ business and striving to exceed their expectations. A case in point that supports Rock and Recycling’s aims was the way in which it listened to Jim’s requirements and came up with the right package and the right deal to support W.J. Graves. Based on these — and taking into account the existing equipment located at the company’s operations — Rock and Recycling supplied a C44 cone crusher, R230 scalper-screener, three R155 scalper-screeners, a 100-foot tracked powered radial stacker, two tracked 80 foot conveyors and two tracked 100-foot conveyors. Given this equipment array, Fletcher confidently expects the McCloskey equipment to produce between 300 to 500 tons per hour of finished product depending on the material and quarry site. All of the equipment acquired by W.J. Graves is portable and fully mobile via tracked chassis, which allows it to be easily moved from site to site. Another essential requirement was the ability to produce different sized products. The McCloskey scalper-screens are perfectly suited for the requirement with easily changed screen meshes. Furthermore, the tracked nature of the equipment enables it to be easily moved out of the blasting zone when needed. The McCloskey R155 high-energy screener is a tough, robust screening tool designed to cope with the heaviest of applications. With the ability to handle some of the worst untreated construction and demolition waste, the R155 can minimize material pre-handling and provide clean end products. As W.J. Graves has found, the R155 is extremely effective across a wide range of applications. With a screening area of 155 ft² across the screenbox — the largest in its class — the R155 has impressed Fletcher’s operators across many applications, working with difficult materials such as heavy rock, sticky clay and fines, as well as boulder clay. McCloskey’s focus on quality components, durability and reliability means that W.J. Graves’ C44 cone crusher provides high performance with its 44-inch cone and a 440HP power unit. It has provided the company with high material capacity and throughput, large stockpile capacity and customer focused features. The C44 cone crusher also provides a high degree of control over the final product — making it the ideal portable secondary crusher. Despite these highly impressive screeners and crushers, Fletcher feels the portable stacking conveyors are the key to the efficiency of his operations. He uses his McCloskey stackers in all of his pits and now rents additional stackers if needed for a particular contract. Designed for use in any terrain, the stacker is easily transported site to site without the need to remove the radial wheels. Built-in levelling indicators allow operators to position the stacker regardless of the ground level, with independent hydraulic pressure control to stabilize once in place. The design of the McCloskey stackers and conveyors allows for the wheels to be fully folded for transport, delivering true portability for operators moving site to site. Much to Jim’s pleasure, the stackers are all about efficiency — from speedy setup time to high degree of mobility — meaning that downtime is minimized while throughput and stockpile capacity are maximized. Hydraulic main lift and top fold are standard, as is the diesel power unit. 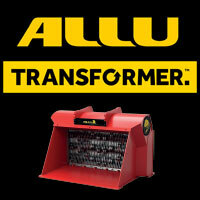 Electric and dual power is also available to get the job done, no matter what the application. The 22.5-degree maximum conveyor angle allows for the highest stockpiles per conveyor length in the industry. With its durable truss frame, large feed hopper and base production capacity of 500TPH, the stackers are also available with optional upgrades to 800TPH. Worthy of particular note is a new option W.J. Graves took advantage of for its ST100T stacker — a lift axle — allowing the conveyor to switch from track mode to radial mode in seconds. Mounted in front of the track bogie, the lift axle comes with internal wheel drive motors for radial travel. The tires feature aggressive tread patterns for more traction in tough terrain. The lift axle is available on all McCloskey heavy-duty stacking conveyors, SDX Telescopic Conveyors and tracked stackers. “We believe in our McCloskey equipment, the dealer — Rock & Recycling Equipment — and McCloskey International. I have had the pleasure of meeting Paschal McCloskey [owner and founder of McCloskey International] at my pit and he truly understands our industry and our business,” said Jim of the relationship that has formed between the three companies. Of the equipment features that have particularly proven to be beneficial, Jim’s praise flows: “We particularly like the wide belts and wide chutes that are on our McCloskey equipment; they don’t plug up, which is a constant problem we have with some of our other equipment. They are also designed to have great access to the engine compartment and other service areas. McCloskey equipment is user friendly and very productive. This entry was posted in Features, Industry News. Bookmark the permalink.